Adeyemi Abati is a medical consultant with ten years’ experience in research, evaluation, teaching and administration both in hospital and education institutions. He has a passion for improving the health and wellbeing of the people. He obtained is MBBS at Lagos university teaching hospital in 2005 and later obtained is MSC in public health in 2007 and PHD in 2010 at the same institution.He has been mentoring young doctors since 2010 and act as a role model for junior consultant at Lagos university teaching hospital. He is the president of the association of medical consultant in Lagos Nigeria and he has contributed immensely to the general reduction of infectious disease in West Africa as a whole. Mr. Afewerki Weldezghi Tesfay is a Master’s student in school of Public Health, Tongji Medical College of Huazhong University of Science and Technology, Wuhan, Hubei, China. He graduated his Bachelor in Probability and Mathematical Statistics from College of Arts and Social Sciences, University of Asmara, Asmara, Eritrea in 2007. He worked in the College of Arts and Social Sciences for five years as an assistant lecturer, and lead the freshman program office of the college as head for four years. He worked in different government institutions namely: - Ministry of Foreign Affairs, and Ministry of National Development-National Statistics and Evaluation Office. He has co-authored two published papers and one on progress for publication. DR, ADEYEMI ABATI COMPLETED IS MBBS IN 2004 AT OBAFEMI AWOLOWO UNIVERSITY TEACHING HOSPITAL ILE –IFE NIGERIA, HE WAS TRAINED AT THE DEPARTMENT OF INECTIOUS DISEASES DURING IS RESIDENCY. AND HE WAS ABLE TO PROVIDE SEVERAL SUPERIOR CARE AND CONSULTAION THAT RESULTED IN OVERALL IMPROVEMENT OF DEPARTMENT PATIENT’S SATISFATION QUOTIENT. DR ADEYEMI FOCUSED ON PATIENT’S TREATMENT AND RE-EVALUATED SEVERAL METHODS OF THERAPY MANAGEMENT DEPENDANT ON INFECTION TYPES TAILORED TO PATIENT’S INDIVIDUAL PATIENT HISTORY AND EFFICACY OF PREVIOUS TREATMENTS. DR, ADEYEMI LATTER PRECEDED AND COMPLETED IS MASTER DEGREE IN PUBLIC HEALTH AT THE SAME INSTITUTION. DR ADEYEMI HAS THEN BEEN PRACTICING IN DEPARTMENT OF INFECTIOUS DISEASE AT LAGOS UNIVERSITY TEACHING HOSPITAL, ONE OF THE TOP TREE INFECTION DISEASE HOSPITAL IN NIGERIAAND ALSO DOING HIS PHD AT THE MOMENT . DR, ADEYEMI CURRENTLY HOLDS A CERTIFICATION FROM NIGERIAN BOARD OF INTERNAL MEDICINE FOR INTERNAL MEDICINE ,HEMATOLOGY AND INFECTIOUS DISEASE AND ALSO AWARDED THE WARD OF THE DEVELOPING LEADER IN MEDICINE FROM NIGERIAN MEDICAL ASSOCIATION IN 2010 FOR HIS EXCELLENT CONTRIBUTION INDR, ADEYEMI ABATI COMPLETED IS MBBS IN 2004 AT OBAFEMI AWOLOWO UNIVERSITY TEACHING HOSPITAL ILE –IFE NIGERIA, HE WAS TRAINED AT THE DEPARTMENT OF INECTIOUS DISEASES DURING IS RESIDENCY. AND HE WAS ABLE TO PROVIDE SEVERAL SUPERIOR CARE AND CONSULTAION THAT RESULTED IN OVERALL IMPROVEMENT OF DEPARTMENT PATIENT’S SATISFATION QUOTIENT. DR ADEYEMI FOCUSED ON PATIENT’S TREATMENT AND RE-EVALUATED SEVERAL METHODS OF THERAPY MANAGEMENT DEPENDANT ON INFECTION TYPES TAILORED TO PATIENT’S INDIVIDUAL PATIENT HISTORY AND EFFICACY OF PREVIOUS TREATMENTS. DR, ADEYEMI LATTER PRECEDED AND COMPLETED IS MASTER DEGREE IN PUBLIC HEALTH AT THE SAME INSTITUTION. DR ADEYEMI HAS THEN BEEN PRACTICING IN DEPARTMENT OF INFECTIOUS DISEASE AT LAGOS UNIVERSITY TEACHING HOSPITAL, ONE OF THE TOP TREE INFECTION DISEASE HOSPITAL IN NIGERIAAND ALSO DOING HIS PHD AT THE MOMENT . DR, ADEYEMI CURRENTLY HOLDS A CERTIFICATION FROM NIGERIAN BOARD OF INTERNAL MEDICINE FOR INTERNAL MEDICINE ,HEMATOLOGY AND INFECTIOUS DISEASE AND ALSO AWARDED THE WARD OF THE DEVELOPING LEADER IN MEDICINE FROM NIGERIAN MEDICAL ASSOCIATION IN 2010 FOR HIS EXCELLENT CONTRIBUTION. 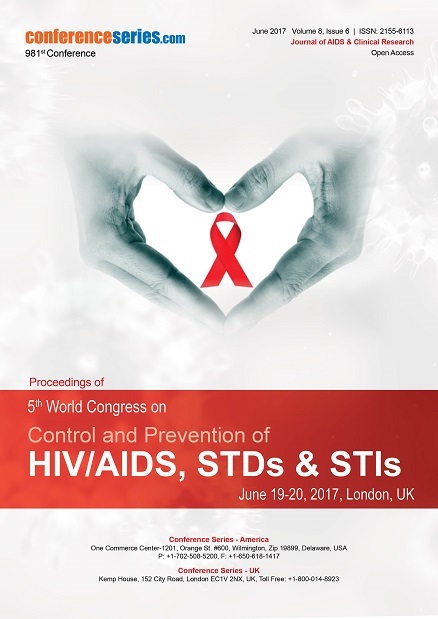 Conference Series Ltd 5th International Conference on HIV/AIDS, STDs and STIs November 13-15, 2017 Las Vegas, USA Recommended Global IMMUNOLOGY Conferences USA & Americas Neuroimmunology 2016, USA Innate Immunity-2017, USA Tumor & Cancer immunology 2017, USA World Immunology Summit-2016, USA Europe & Middle East Immunology World 2017, UAE Allergy-Clinical Immunology 2017, UK Euro Immunology 2017, Spain Autoimmunity 2016, UK Asia Pacific Immunologist Meeting 2017, Malaysia COPD 2017, Japan Organizing Committee Submit Abstract Register Now Scientific Program Search Search 1000+ Events Home About Us Journals Conferences Abstract Registration Technical Program Venue & Hospitality Sponsors / Exhibitors Awards Experts Out Look OCM for STD AIDS Series Conferences Organizing Committee - STD AIDS 2017 We are Updating Organizing Committee Members Shortly... Organizing Committee - STD AIDS 2016 OCM Member Daniel Bauer Motivational speaker/ TV artist HIV escape artist USA Biography Research Interest × Biography Daniel Bauer is internationally revered as the Successor to the legendary escape artist Harry Houdini and globally respected as a 12-year warrior and survivor living with HIV/AIDS. Through heart-breaking loss, such as burying his baby brother who passed from AIDS-related complications, to conquering impossible moments of rare survival, he has gracefully triumphed to once again pursing his dreams. He is one the most requested motivational public speakers and entertainers who continues to present highly engaging educational experiences and spectacularly, life-changing theatrical productions to tens of thousands annually (adolescents, healthcare professionals and mainstream communities &audiences at-large) focusing on topics such as living with HIV/AIDS, prevention, reversing HIV/AIDS-related man-made stigma and so much more. He is the current active celebrity voice and face of JustGetTested.com. He continues to work tirelessly to promote equality for all living with and/or affected by the global HIV/AIDS pandemic. His work as both an escape artist and speaker have been featured on: National Television Networks [NBC, CBS, ABC and FOX], International print/radio media (i.e. poz.com/blogs, positivelite.com, NPR Radio, Poz I Am Radio Show),International Theatrical Stages including New York City off-Broadway; and has been highlighted at internationally revered events such as The OMICS Group2013 International HIV/STI Conference, The National Healthy Living Summit, 2012 International AIDS Conference (AIDS Reunion Program, Washington, D.C.), The 2013 University of Minnesota African Student Association Red Spots Gala, and The Texas State-wide HIV/HEI Conference. Close OCM Member Charbell M.H. Kury Professor of Medicine Federal University of Rio de Janeiro Brazil Biography Research Interest OCM Member Hiroshi Ohrui Professor Yokohama University of Pharmacy Japan Biography Research Interest OCM Member NWAKO, Okechukwu Francis Lecturer Madonna University Nigeria Biography Research Interest Organizing Committee - STD-AIDS-2015 OCM Member Daniel Bauer Motivational speaker/ TV artist HIV escape artist USA Biography Research Interest OCM Member Halina Baran Professor Karl Landsteiner Research Institute Mauer Austria Biography Research Interest OCM Member Michelle Moorhouse Senior Clinician Wits RHI South Africa Biography Research Interest OCM Member Bernardino Geraldo Alves Souto Professor Federal University of São Carlos Brazil Biography Research Interest OCM Member Charbell M.H. Kury Professor of Medicine Federal University of Rio de Janeiro Brazil Biography Research Interest OCM Member Devendra Kumar Agarwal Senior Consultant Indraprastha Apollo Hospitals, India India Biography Research Interest OCM Member NWAKO, Okechukwu Francis Lecturer Madonna University, Nigeria Nigeria Biography Research Interest Organizing Committee - STD-AIDS-2014 OCM Member Huynh Manh Vu President & CSO Genomeplex Research Institute, Inc. (GRI, USA Tel: (619) 737-6786 Fax: (858) 935-9083 Biography Research Interest OCM Member Andrew D. Badley Director HIV Immunology Lab, Professor of Medicine Mayo Clinic and Foundation, USA Tel: (507) 284-2511 Biography Research Interest OCM Member Berthold Kepplinger Medical DirectorKarl Landsteiner Research Institute for Neurochemistry, Austria Biography Research Interest OCM Member Simona Claudia Cambrea Associate Professor, Ovidius University, Romania Ovidius University, Romania Biography Research Interest OCM Member Baran Halina Professor Karl Landsteiner Research Institute for Neurochemistry, Austria Biography Research Interest OCM Member Francois Villinger Professor-Department of Pathology & Laboratory Medicine Emory University School of Medicine, USA Tel: 404-727-5621 Fax: 404-727-4531 Biography Research Interest OCM Member Stela Halichidis Director of the Department of medical faculty Ovidius University, Romania Tel: 40723182235 Biography Research Interest OCM Member Daniel Bauer Successor to the legendary escape artist Harry Houdini, USA Successor to the legendary escape artist Harry Houdini, USA Biography Research Interest OCM Member Yunda Huang Senior Staff Scientist- Vaccine and Infectious Disease Division Fred Hutchinson Cancer Research Center, USA Tel: (206) 667-5780 Fax: (206) 667-4378 Biography Research Interest OCM Member AboulAta President Arab Society for Virology Egypt Tel: 20-01228061577 Biography Research Interest OCM Member Nafees Ahmad Professor of Immunobiology, College of Medicine The University of Arizona Health Sciences Center, USA Tel: (520) 626-7022 Biography Research Interest OCM Member Ramendra Kumar Singh Associate Professor- Department of Chemistry University of Allahabad, India Tel: 532-2461005 Biography Research Interest OCM Member Heather Jaspan Senior Scientist- Seattle Biomedical Research Institute, USA Senior Lecturer- University of Cape Town, South Africa Tel: 27 21 4066823 Fax: 27 21 4066029 Biography Research Interest Organizing Committee - STD-AIDS-2013 OCM Member Vladimir Zajac Cancer Research Institute Slovakia Biography Research Interest OCM Member Jesus Felizzola Miami AIDS Project USA Biography Research Interest OCM Member Aboul-Ata E Aboul-Ata Arab Society for Virology Egypt Biography Research Interest OCM Member Stela Halichidis Ovidius University Romania Biography Research Interest OCM Member Narasaiah Kolliputi University of South Florida USA Biography Research Interest OCM Member Nils von Hentig Wolfgang Goethe University Hospital Germany Biography Research Interest Conferenceseries Destinations Conferences By Continents USA & Americas USA Brazil Canada Mexico Asia-Pacific Australia China India Japan Malaysia New Zealand Philippines Singapore South Korea Europe & Middle East Austria Denmark Finland France Germany Italy Netherlands Norway Poland South Africa Spain Switzerland Turkey UAE UK Ukraine Medical & Clinical Conferences Alternative Healthcare Dentistry Diabetes & Endocrinology Healthcare Management Infectious Diseases Medical Ethics & Health Policies Neuroscience Obesity Ophthalmology Pathology Physical Therapy Rehabilitation Radiology Surgery Cardiology Dermatology Gastroenterology Immunology Medical Microbiology Nursing Oncology & Cancer Palliativecare Pediatrics Psychiatry Reproductive Medicine & Women Healthcare Vaccines Conferences By Subject Agri, Food & Aqua Business & Management Chemistry Environmental Sciences Geology & Earth science Materials Science Nephrology Petroleum Pharmaceutical Sciences Pulmonology Veterinary Biochemistry Chemical Engineering EEE & Engineering Genetics & Molecular Biology Hematology Nanotechnology Nutrition Pharma Marketing & Industry Physics Toxicology Mail us at Drop us an email for Program enquiry. 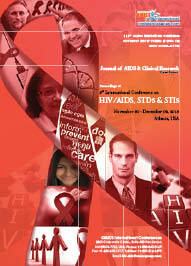 hiv-stds@conferenceseries.net Sponsors / Exhibiting / Advertising. 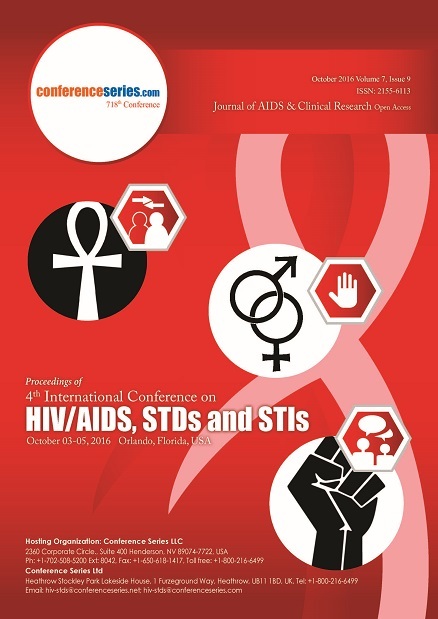 hiv-stds@conferenceseries.com General Queries. 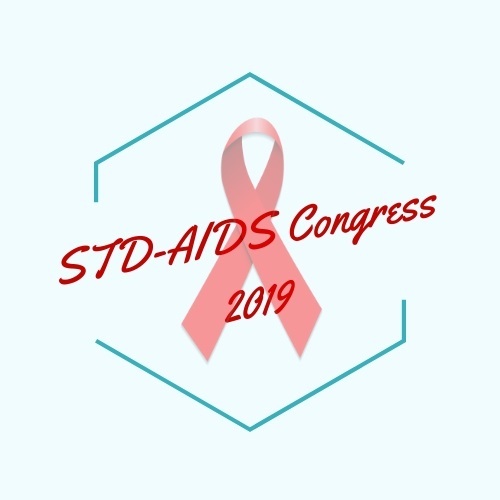 hiv-stds@hotmail.com Be a member and support us Join Our Mailing List Suggest A Speaker Suggestions Invite Proposals Highlights from last year’s Convention! View Past Conference Report View Conference gallery View Proceedings Authorization Policy By registering for the conference you grant permission to Conferenceseries Ltd to photograph, film or record and use your name, likeness, image, voice and comments and to publish, reproduce, exhibit, distribute, broadcast, edit and/or digitize the resulting images and materials in publications, advertising materials, or in any other form worldwide without compensation. Taking of photographs and/or videotaping during any session is prohibited. Contact us for any queries. B Copyright © 2015-2016 Conferenceseries Ltd, All Rights Reserved. Last revised : October 6, 2016 12:00:00 IST. Huynh has received Ph.D. in Bio-Organic chemistry from the University of Tokyo, Japan, in 1979. He was chemist at Nippon Kayaku Chemical Co. Japan and postdoc with School of Pharmacy, Purdue University. He worked with Stanford Research Institute International, in Bio-Organic Chemistry Department, and Applied Biosystems Inc., in R&D Department. Huynh was senior manager in anti-HIV research at Triplex Pharmaceuticals Inc., and molecular diagnostic research at Gen-Probe Inc. From 2009, he worked as CSO of Genomeplex Research Institute, Inc. for manufacturing of Real Time PCR for HIV-1 virus. He has more than 200 presentations, publications and product developments with companies. Andrew D. Badley, M.D., was born in Sydney, Nova Scotia, Canada. He earned his B.S. degree in 1985 and M.D. degree in 1990, both from Dalhousie University in Halifax, Nova Scotia. After completing residency training in internal medicine at Mayo Clinic in Rochester, Minn., in 1994, Dr. Badley completed further training at Mayo Clinic as a clinician investigator trainee in the Division of Infectious Diseases in 1997. During his training, Dr. Badley received the Dr. J. Geraci Award for Excellence in Infectious Diseases from Mayo Clinic in June 1997, as well as the Young Investigator Award from the Interscience Conference on Antimicrobial Agents and Chemotherapy and American Society for Microbiology (ICAAC/ASM) in September 1997. Dr. Badley joined the staff of Ottawa Hospital in Ottawa, Ontario, Canada, in 1997 as an assistant professor in the Division of Infectious Diseases and in 2002 was promoted to an associate professor. In 2002, Dr. Badley returned to Mayo Clinic in Rochester as a consultant in the Division of Infectious Diseases and brought with him his successful research program. At Mayo Clinic, Dr. Badley is currently a professor of medicine and consultant in the Division of Infectious Diseases; associate director of the Research Resources component of the Center for Translational Science Activities; and theme leader for infectious disease research on the Research Development Council, an internal Mayo committee. virus-host interactions, in particular how viral proteins modify the host immune response and/or cell survival. erthold Kepplinger was medical director of the neuro-rehabilitation Wall Amstetten and the Neuro Rehabilitation and Pain Wall Amstetten and Head of acute Logie and Stroke Unit. In the past 10 years, he worked as medical director of the State Hospital Wall Amstetten. Baran Halina is presently Head of the Karl Landsteiner Research Institute for Neurochemistry, Neuropharmacology, Neurorehabilitation and Pain Treatment Mauer, Lower Austria, From 2005 - 2011 she was the head of Head of the Neurochemical Laboratory Karl Landsteiner Institute Mauer and Head of Neurophysiology, Veterinary Medical University Vienna. Francois Villinger, DVM, PhD, Chief of the Yerkes Division of Pathology, graduated from the University of Zurich, Switzerland. The primary research interests of Dr. Villinger and his lab team are modeling human infectious diseases in relevant nonhuman primate models, particularly for those diseases without other models and those that do not reproduce human pathogenesis. These diseases include HIV/AIDS as well as infection models of XMRV, dengue fever and listeria. As Chief of the Division of Pathology, Dr. Villinger oversees the administrative functions of the division. This entails oversight of the administrative staff, approving grant submissions by division faculty and trainees, ensuring appropriate allocation of division resources and mentoring junior faculty. Dr. Villinger is involved in reporting division research activities to the National Center for Research Resources (NCRR) and preparing progress and plan descriptions of division research activities for the Yerkes Research Center’s P51 base grant renewal. Dr. Villinger also serves as the liaison between division staff and the Yerkes administration, and advises the director on issues related to the scientific mission of the Center. In addition, the Villinger lab runs a NCRR-funded resource that provides nonhuman primate specific immunomodulatory reagents, such as recombinant cytokines and soluble forms of immune-receptors, to investigators on a national and international level. The Yerkes research center provides 60 samples annually. Immunology of infectious diseases, AIDS and resource for nonhuman primate immune reagents. Stela Halichidis is a director in the Department of Medical Faculty at Ovidius University, Romania. She was head of HIV department, Constanta, Romania. 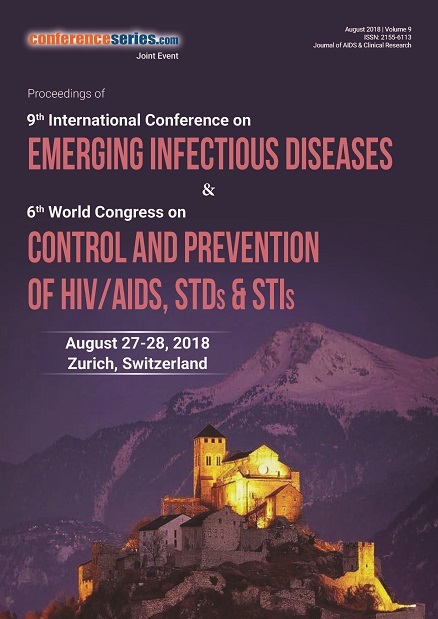 She has published various papers related to HIV, and is member in many national and international medical associations (ESCMID, ESC, Romanian Infectious Diseases Society, Balcanic Medical Society, Romanian Parasitology Society, International AIDS Society, and Balkan Environmental Association). Daniel Bauer is internationally revered as theSuccessor to the legendary escape artist Harry Houdini and globally respected as a 12-year warrior and survivor living with HIV/AIDS.Through heart-breaking loss, such as burying his baby brother who passed from AIDS-related complications, to conquering impossible moments of rare survival, Daniel Bauer has gracefully triumphed to once again pursing his dreams. Daniel Bauer is one the most requested motivational public speakers and entertainers who continues to present highly engagingeducational experiences and spectacularly, life-changing theatrical productions to tens of thousands annually(adolescents, healthcare professionals and mainstream communities &audiences at-large)focusing on topics such as living with HIV/AIDS, prevention, reversing HIV/AIDS-related man-made stigma and so much more. Daniel Bauer is the current active celebrity voice and face of JustGetTested.com. He continues to work tirelesslyto promote equality for all living with and/or affected by the global HIV/AIDS pandemic. His work as both an escape artist and speaker have been featured on: National Television Networks [NBC, CBS, ABC and FOX], International print/radio media (i.e. poz.com/blogs, positivelite.com, NPR Radio, Poz I Am Radio Show),International Theatrical Stages including New York City’s off-Broadway; and has been highlighted at internationally revered events such as The OMICS Group2013 International HIV/STI Conference, The National Healthy Living Summit, 2012 International AIDS Conference (AIDS Reunion Program, Washington, D.C.), The 2013 University of Minnesota African Student Association Red Spots Gala, and The Texas State-wide HIV/HEI Conference. And if that is not enough of an iconic ship of accomplishment, Bauer has also held prime consulting and contractual professional positions in the fields of government, education, special event planning, fund raising and youth development programming to promote healthy-living and equality for all walks of life while continuing to create waves, inspire hope and promote positive change among our communities to unite global synergistic efforts in the fight against HIV/AIDS. 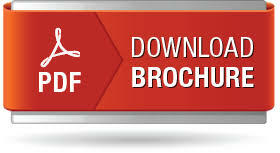 Design and analysis of clinical trials for vaccines against infectious diseases, Statistical methods in immunological assay validation and evaluation, Statistical methods in equivalence testing, Immune correlates of protection and Meta-analysis. Dr. Aboul-Ata Elnady ABOUL-ATA, Professor Dr. of Plant virology, who was born on Mar.22nd 1948 in Sharkia, Egypt, is the president of ArSV (Arab Society for Virology) in 2013. He was formerly Department Head of Plant Virus and Phytoplasma Research, Plant Pathology Research Institute at Agricultural Research Center, Giza, Egypt for 3 years (2003-2006), and Head of Molecular laboratory at Plant Virus and Phytoplasma Res. from Sep. 2005 up to now. Dr. Aboul-Ata is the author of more than 40 scientific papers in different approaches like gene silencing, sequencing of viral genes. He lead an Egyptian research group (human virologists and molecular biologists) for a Swedish-funded project on Plant-based vaccine against HSV-2 in collaboration with Gothenburg University, Sweden throughout 2007-2010. He also lead a MERC project on detection of cereal viruses for prevention through quarantine system in Middle East countries (Egypt, Jordan, Israel and Palestine) throughout 2008-2011. He is in charge of nanoscience introduction to the domain of plant virology at Plant Pathology Research Institute. He is chosen for general-, scientific- and organizing-committee member for the First and 2nd Conference of Virology, which was organized by ESV at 2004 and 2008, Cairo, Egypt. He has also been chosen to be International Advisory-committee member for the 2nd Green revolution in India that is organized from 2-5 July, 2009. He is an evaluation-committee member for promotion to higher scientific position i.e. Assoc. Professorship and Professorship at Institute of Plant Pathology, ARC, Egypt 2008 up to now. Dr. Nafees Ahmad received his B. S.(Hons) in Chemistry and M. S. in Biochemistry from one of the prestigious central universities in India, The Aligarh Muslim University. He then joined another renowned research institute, The Central Drug Research Institute, Lucknow, India, from where he earned his Ph.D. in 1983. Dr. Ahmad did his Postdoctoral Fellowship at the National Institutes of Health (NIH), Bethesda, Maryland, USA from 1985-1990 in the Laboratory of Molecular Microbiology, National Institute of Allergy and Infectious Diseases. His research primarily focused on the regulation of HIV-1 gene expression and replication, especially the role of HIV-1 regulatory and accessory proteins in HIV-1 replication and biology. In 1990, a group of scientists from the NIH, including Dr. Ahmad moved to J.N. Gamble Institute of Medical Research, Cincinnati, Ohio to start a new program on Molecular Virology, including his own independent research program on molecular mechanisms of HIV-1 mother-to-infant transmission. In 1994, Dr. Ahmad joined the University of Arizona College of Medicine’s Department of Microbiology and Immunology (now Immunobiology). His research involves understanding the molecular mechanisms of differential HIV infection in infants and adults and vertical transmission and pathogenesis. In addition, he directs the Immunity and Infection block of the medical curriculum of the College of Medicine. Dr. Ramendra K. Singh, an Associate Professor of Chemistry at the University of Allahabad, India, is Director of the Nucleic Acids Chemistry and Antiviral Research laboratory and is member of several national committees. He has several awards/fellowships, like ISCA Young Scientists Award, INSA Visiting Fellowship, UNESCO Fellowship, XVI IUBMB Fellowship, Jawaharlal Nehru Visiting Fellowship, Post-Doc Fellowship, Govt of Japan, INSA International Exchange Fellowship and Fulbright-Nehru Senior Research Fellowship to his credit. His research interest lies in computer-aided designing and development of antiviral molecules against HIV, HPV and JEV and developing fluorescent oligonucleotides for use in the field of molecular biology and diagnostics. He has about a dozen anti-HIV and half-a-dozen anti-JEV compounds under patent processing. Dr. Singh is on editorial board of several international journals and referee to more than a dozen journals. Heather initially completed her BS in Biology at the University of North Carolina, Chapel Hill, moving on to study for an MD/PhD in Molecular and Cell Biology at Tulane University, New Orleans, qualifying in 1999. She currently is a Senior Scientist at Seattle Biomed and a Senior Lecturer at University of Cape Town. She also holds an affiliate Associate Professorship at University of Washington’s Department of Global Health. prevention of HIV acquisition in children and adolescents and immunology thereof.